What are the best-rated classic earbuds right now? Looking for classic style earphones? Below you’ll find the top model on the market right now. 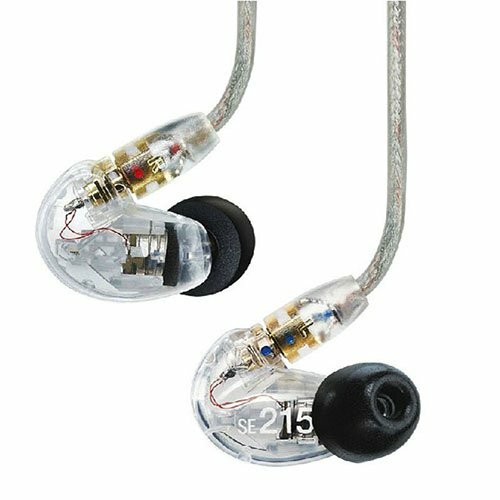 What’s the Difference Between Classic Earphones and In-ear Headphones/In-ear Monitors? What Does That Mean for User Experience? The difference between classic earbuds and in-ear earbuds (also known as in-ear monitors (IEMs) or in-ear headphones) is their design. The classic earphones lay on the outside of your ear while in-ear earphones enter further in the inner canal. The in-ear headphones also come with rubber or foam ear tips that you can replace to adjust the fit. Above is an example of very popular in-ear earbud design (also called in-ear monitors (IEMs), in-ear headphones) Shure SE215 are one of the most popular in-ear earbuds by musicians and non-professional users alike. And the above picture is probably already familiar with you. The classic Apple earbud design is one of the most popular one until date. Generally, you will get a better seal and thus better sound quality from in-ear monitors. Classic earbuds don’t have such a good passive noise isolation which means more sound gets distorted by noises around you before it reaches your inner ear. On the other hand, in-ear design proves uncomfortable for a lot of people, especially those with smaller ear canals. Not to mention you have to replace the eartips when they get worn out with use. Some people just don’t like the hassle. The classic earbud design is simpler and doesn’t require any eartip replacement. Because of this a lot of people find them comfortable for long periods of time. If you want a simple solution for listening to audio books and don’t like the in-ear design, classic earbuds might just be what you’re looking for. Since the in-ear design (in-ear monitors (IEMs), in-ear headphones) has become the standard in popular consumer electronics, most people call them just earbuds even though that is technically incorrect. Among the audiophile community people understand the difference between the earbuds and in-ear monitors and name them accordingly. Since most people aren’t audiophiles we use the name “earbuds” for in-ear monitors/in-ear headphones because this is what people expect. If you go to a store, most people will understand what you mean if you say classic earbuds or in-ear earbuds. Check more detailed reviews of each classic earbud model below. 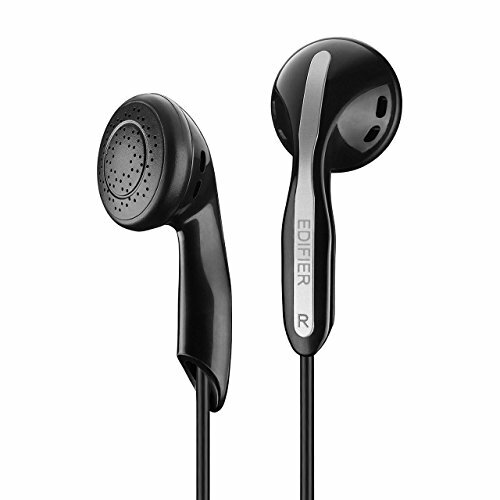 The Edifier H180 earphones deliver great sound in a traditional earbud design that fits well all for a low price. If you’re looking for a quality replacement for your smartphone earbuds or need a backup pair, definitely check these out. 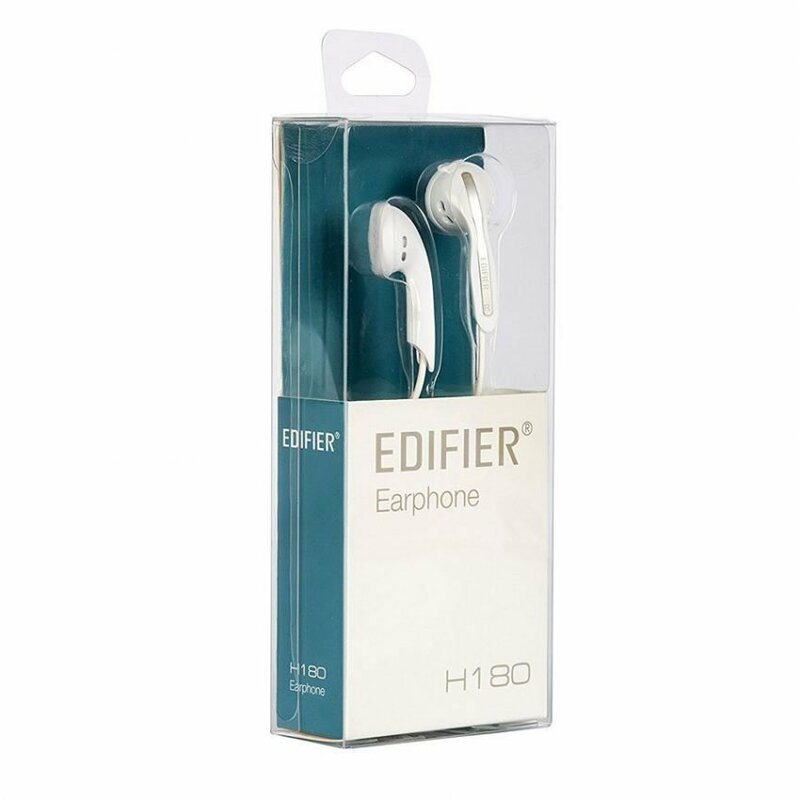 The plastic earbud case on the Edifier H180 earphones is shaped in the classic earbud design, but most users will find them more comfortable than other brands. The provided foam covers add an extra layer of padding and comfort. There isn’t a lot of noise isolation since the earbuds don’t create a tight seal, but that is a good thing if you want to be aware of your surroundings. Even without a tight seal, there is minimal noise bleed, so you can listen to your music, podcasts, or audiobooks in relative privacy. Here you can find top noise isolating headphones. You won’t experience any ear canal irritation with these earphones since they don’t have silicone inserts or components that fit deep in the ear. The H180 earbuds tend to fit better and stay more secure than a lot of stock earbuds supplied by phone and electronics manufacturers. Users with smaller ears will notice some discomfort and pressure points in the ear during long listening sessions, but that is often the case with this style of earphones. The overall build quality of the Edifier H180 earbuds is good, and the components hold up well for everyday use. The 4-foot (1.3m) cable features a 3.5mm straight connector and is coated in a TPE wire jacket that is very flexible and pliable for portable use and does not kink easily. Strain relief for the cables on the earbud side is ok, but it can fail if the cables are pulled too hard. The H180 earbuds are available in black or white, with subtle silver lettering that indicates the brand and Left/Right notation. If you want an in-line mic with TalkBack functionality on the phone, you’ll need to go with the P180 model. While these earbuds do not include in-line volume controls, the P180 model will include a single multi-function button for play/pause or call answer. The foam earbud covers work well and stretch tight over the plastic case, but they can slip off over time. Replacements are easy to find if you need them. A one-year warranty is provided and the company seems to offer good support. The sound quality of the Edifier H180 is rather impressive considering its low cost and unassuming design. You might even forget that you’re listening to earbuds instead of larger over the ear style headphones. Volume output is good, and even suitable for listening on a plane or commuting in louder environments. Bass frequencies are presented with a solid presence, but they aren’t overwhelming or over-pronounced. Using the H180 earbuds without the foam cushions may provide a little bit tighter seal between the plastic and the ear, with only a slight change in sound quality. Highs are crisp and clear with good sibilance control so that you don’t hear a lot of harsh tones. The soundstage is reasonably wide and provides good depth for a pleasing listening experience with a variety of musical genres. The sound quality might not compete with audiophile earbuds or premium in-ear monitors, but it is quite good for the price you pay for this classic earbud style. If you want a quality set of earbuds that sound good and won’t break the bank, the Edifier H180 earbuds are an excellent choice and top pick in this category. Don’t let the price fool you on these Sennheiser MX 365 earphones. The sound quality is much better than you might suspect coming from a sub-$20 product. While the construction quality and product feel isn’t phenomenal, the color options and sonic performance are good which makes them a great choice. Overall comfort level for the Sennheiser MX 365 earphones can really vary, depending on the size of your ears. These earbuds are a little bit larger than some of the other brands available, which means those with smaller ears may experience some discomfort and a poor fit. The included foam earpads add a nice cushion if you want to soften the feel of the plastic earbud shell. Users that don’t like a deep in-ear type of fit will appreciate the classic earbud design that won’t cause ear-canal irritation or discomfort. While the sound quality is good for long listening sessions, the earbud design is not the best for long-term use. The MX 365 earphones are not the least comfortable, but they don’t rank super high in this category. The surprising thing about these earbuds is the sub-standard build quality that is less than what you might expect from a brand like Sennheiser. The plastic earbud enclosures feel very lightweight, which is ok for comfort and stability in the ear, but the construction feels cheap. That’s not to say that the Sennheiser MX 365 won’t last you for a long time, because they are fairly durable if they aren’t subjected to too much moisture and abuse. A 3.5mm angled connector is provided at the end of the 4-foot (1.3mm) symmetrical black cable that has a flat profile. The cable has a PVC-type of coating which is not as soft or flexible as some other headphone cables with a rubberized jacket. The cable can also have some wire memory from shipping or storage. The MX 365 is available in six different colors: white, red, blue, orange, bronze, and brown. And for the price, you may want to pick out a few different colors. There are no in-line controls or TalkBack mic available for the MX 365, so do not expect to use these for phone calls or remote control of your smartphone. Sennheiser provides their standard 2-year warranty for the MX 365, so if you have any trouble with the quality or durability you can file a claim within 24 months. Interested in gaming headphones, check the best-rated models. 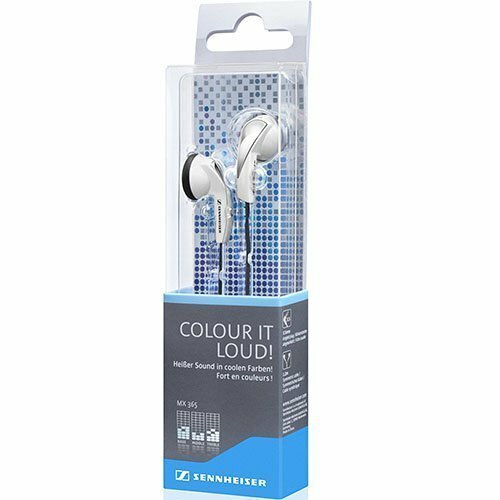 This is the category where you’d expect Sennheiser to deliver quality results, and the MX 365 earphones certainly provide great sound for the price. The soundstage is better than most earbuds and the overall tonal signature is quite smooth and balanced. Bass is present and forward enough without sounding exaggerated and over-produced. Mids are balanced, warm, and deliver good vocal clarity that isn’t too sharp. Highs are strong, but can sound just slightly turned down, which can work well to combat ear fatigue if you’re listening for a long time. Some users have reported minor bass distortion or driver rattling during initial testing, but this noise, if present, tends to go away after a sufficient burn in period. 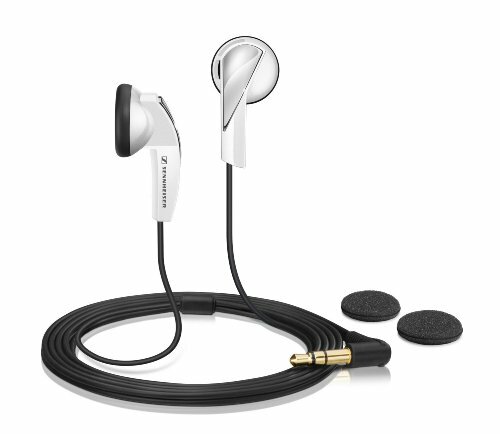 The Sennheiser MX 365 earphones are electrically efficient, which provides greater overall volume level than several other common earbud brands. If you are looking for a mix of colorful style options and good sound quality, the Sennheiser MX 365 earphones are a great option for your listening pleasure. While the Sony MDRE9LP/BLK earphones aren’t going to win any awards for sound quality, they are a good choice as a backup pair or for listening to podcasts. Sound quality for these earbuds is average for this price and listeners looking for a deep and expansive audio experience may want to look elsewhere. You can find best cheap in-ear headphones here. The compact and lightweight design is easy to wear and suitable for a variety of ear sizes. The earbud shape is not a perfect circle, so it can fit the ear a little better. With an tailpiece that is shorter than most other earbuds, the Sony MDRE9LP/BLK are lightweight, compact, and stay in the ear fairly well. Users who want to wear a hat or helmet over the ears should find that these earbuds work fairly well for that since they don’t stick out from the ears too far. The hard plastic shell of the earphones may cause discomfort and pressure points after long listening sessions, but that is common with this type of design. 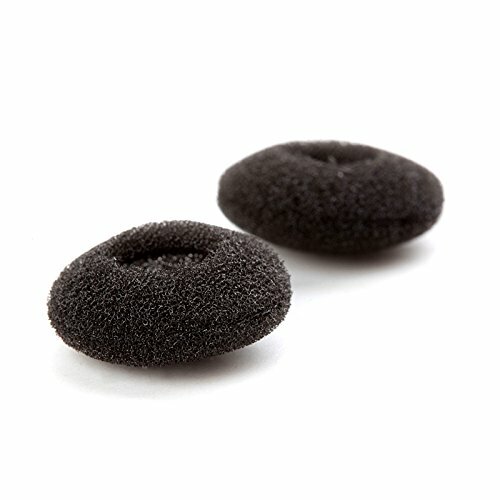 Thin foam earbud covers are provided, but they don’t necessarily add a lot of comfort. You can purchase third party covers if you want a more plush feel. With a classic design, users of previous Sony earbuds will likely appreciate the fit and feel of the MDRE9LP. In terms of style, Sony gets an extra vote for offering several colorful styles of earbuds to choose from. The semi-transparent plastic construction looks nice too. Quality control and construction quality is what you might expect for a low-cost set of earbuds. It isn’t great, but they should last several months or more with normal wear. Some users have reported, surprisingly, that these earbuds can last through a laundry cycle or two and still work just fine. The cable is a fairly standard length of 47” (1.2m) and features a 3.5mm angled headphone jack with good strain relief at all connections. Cable jacket material and construction is good and is quite resistant to splitting or cracking – something other cheap cables can have a problem with. 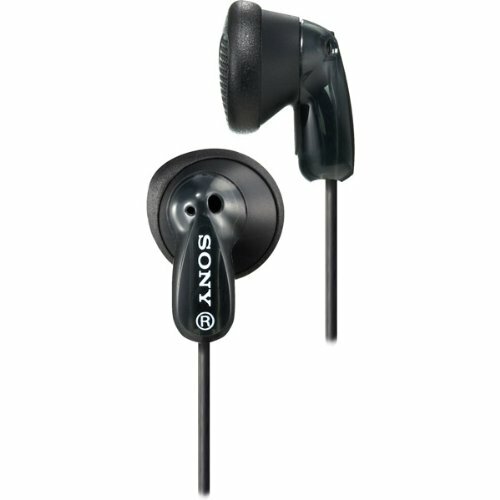 However, the cable construction and design of the Sony MDRE9LP/BLK earphones is prone to tangling and can easily become knotted if stored loose in a bag or pocket. These classic earphones have no in-line controls or mic for use with mobile phones. There is no ambient noise isolation, so listening in loud environments may require a higher listening volume level, which can lead to the next issue. You may hear a bit of crackling noise if the earbuds are “overdriven” with high volume levels or when moving the connector around. The Sony MDRE9LP/BLK earphones might not blow you away with amazing bass or a rich soundstage, but they are great for vocal content like podcasts and audiobooks. The 13.5mm neodymium drivers are a bit small, producing reasonably solid highs and mids, but they can sound tinny for certain musical genres. Bass response is lacking just enough that the sound isn’t very deep or immersive, but the casual music listener should be satisfied with the general performance. Listening at lower volume levels provides a clearer and more articulate quality that works great for podcasts and interviews. For a budget-friendly set of earbuds, the Sony MDRE9LP/BLK earphones aren’t terrible, just not as good as the best classic earbuds, so consider these only as a good, cheap backup pair. Panasonic RP-HV096 earbuds are a low-cost alternative to the stock earbuds that ship with a lot of other consumer audio devices. If you need a spare pair of earbuds for the car, gym bag, or pockets, these will be great because you won’t have to worry about loosing or breaking them at this price. If you are used to wearing a traditional earbud design, these units should fit well and work just fine. The physical profile of the case is about average and not too bulky or awkward in the ear. However, active exercise can cause the earbud to fall out pretty easily. The larger driver size of the Panasonic RP-HV096 earbuds means that they won’t be a good fit for smaller ears or if you are sensitive to pressure points in the ear. Foam cushions are not provided with these earbuds, so if you desire extra padding for fit or comfort you’ll need to purchase those separately. Overall, the Panasonic earbuds are just about average, perhaps a little below, when it comes to comfort and fit. The first impression that you might get when unboxing the Panasonic RP-HV096 earbuds is that they have a very hollow plastic feel to them. 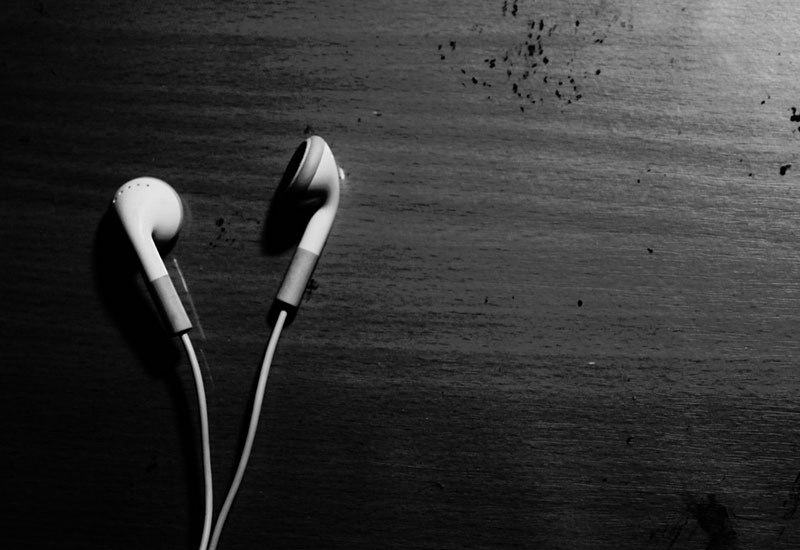 While construction quality and inspection of the earbuds may not initially inspire confidence, they should work just fine if you take care not to abuse them. Want something more durable? Get tank-like in-ear headphones here. 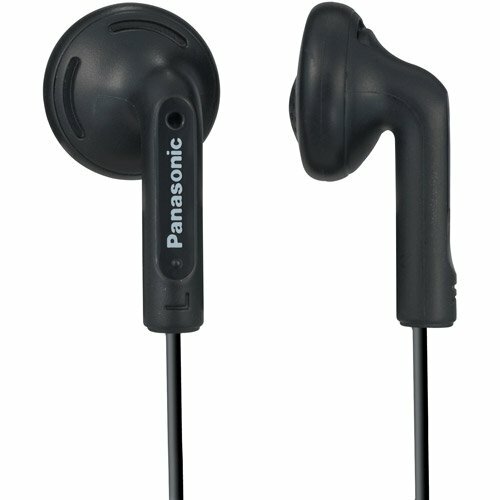 The black plastic shell is subtly marked with the Panasonic brand and a stamped relief for Left/Right notation on each earbud. Keeping these earbuds clean is pretty easy because there is no soft silicone-type coating on the shell that can feel tacky and attract dirt. The 47” (1.2m) cable with an angled 3.5mm connector allows for convenient connection to your music player or phone. The Panasonic RP-HV096 earbuds don’t have any in-line microphone or remote-controls. It is possible that you could receive a set of earbuds that are bad from the factory. This can happen sometimes with cheaper electronics. Simply replace them if needed. There have been a few quality control issues noted, with some headphones having a lot of static at higher frequencies and problems with getting a solid connection. If you’re hard on headphones and are constantly breaking them, these might work for you since they are so cheap to replace. The large 14.8mm neodymium drivers produce fairly smooth bass tones, but the power in this lower spectrum is not great, making it hard to hear the bass at times. High frequencies are well represented, but don’t expect a lot of high-end brilliance, shimmer, or sparkle translated in your music. That hollow sounding shell construction seems to have a negative impact on the sonic presence, power, and character of the earbuds. It is also good to keep in mind that these earbuds don’t have any noise isolation, and people nearby can hear what you are listening to at moderate volume levels. The cheaper construction and components of the Panasonic RP-HV096 earbuds just can’t keep up with the sound quality of many other models that are in this category. The redeeming quality of these earbuds is that they are better than many of the free earbuds that come with some electronics, so they can be a good replacement option. Panasonic RP-HV096 earbuds are some of the cheapest earphones we recommend because of their simple utility, affordability, and basic performance. Pick these up if you worry about damaging or loosing more expensive earbuds all the time. 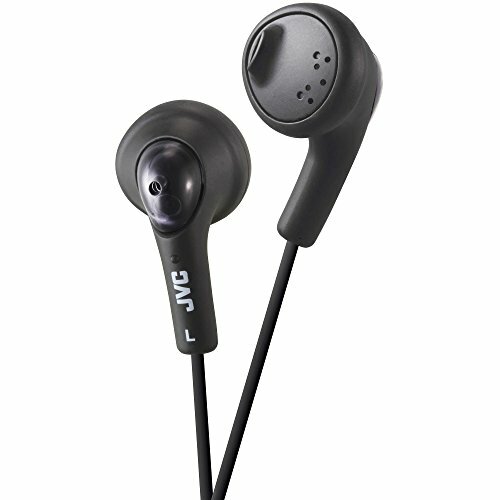 With lots of style options, decent audio performance, and a comfortable fit, these JVC HAF160B Gumy earbuds are a popular standard for low-cost earphones. They rank high in comfort level, and the sound quality and durability aren’t bad either, especially considering an average price of less than $10. The softer rubberized shell of the JVC HAF160B Gumy earbuds makes them a comfortable alternative to the typical hard plastic construction of other earbuds. The fit is snug, providing good stability and grip in the ear. These earbuds are great for activities and exercising. With a slightly oval shape and soft coating, the earbuds readily fit the contour of the ear and are great for long listening sessions. Perhaps the only downside in this category is that there is a very small protrusion or rubber fin on the faceplate of the earbud that sticks out a tiny bit. 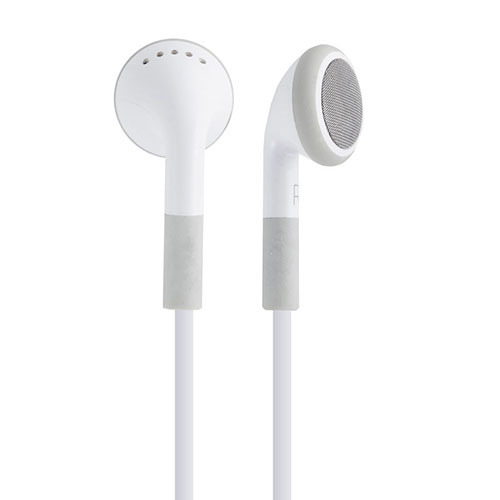 This section can cause some minor rubbing or irritation for users with smaller ears or if the earbuds are not positioned properly. The build quality for the JVC HAF160B gumy earbuds is average, beating out some of the cheaper earphones on this list. Despite their rubberized coating, these earbuds are not waterproof, but they will hold up well under most user environments, including most workouts. Available in eight different colors, there are plenty of style combinations to choose from. And the great thing is that the cord is the same color as the earbud. The cable is a symmetrical tangle-resistant design with a flat profile. At about 40 inches (1.0m), the cable is shorter than several other earbud sets, but this is a good thing if you don’t like managing excess cable in your pocket. Don’t like cables? Find top-rated Bluetooth earbuds. The weakest link in the design of the JVC HAF160B earbud is the 3.5mm straight audio jack and integrated strain relief. The manufacturing tolerance of the nickel-plated jack isn’t great, so it can move around and cause some noise if the device or cable isn’t secure. Note that these are listening-only earphones and there is no in-line volume control or talkback mic for use with smartphones or other music playback devices. Sound quality for the gumy earbuds is average, so if you’re an audiophile or looking for exceptional sound quality, these headphones probably aren’t for you. The unique design of the JVC HAF160B earbuds includes a faceplate that is intended to enhance the bass response of the earbud, and it seems to accomplish this task. The 13.5mm drivers are small, but deliver a warm and mellow bass presence that is neither overwhelming nor saturated. The treble is fairly well balanced and not too harsh except in the higher register where it gets brighter and a bit tinny. Mids are the lowest performing range and they can be perceived as a bit sloppy and muddy, especially with rock styles of music. Louder than several other common earbuds, the HAF160B can produce enough volume to satisfy most users listening in louder environments. However, you may hear a bit of breakup in articulation of the higher frequencies when the earbuds are pushed to higher volume levels. These earbuds are perfect for listening to podcasts and audiobooks, and they are a reasonable all-around music listening headphone. Just don’t expect sonic fidelity from them. Consider the JVC HAF160B gumy earbuds if you want a comfortable and secure fit with a track record of dependable sound quality and durability for a price that won’t make you worry about buying several pairs to keep handy wherever you are. Philips SHS3200 earhook headphones are perfect for the listener in need of a lightweight earphone that won’t fall out during activities and workouts. The larger drivers and special bass tube provide good sound quality, and the flexible earhook design allows the earbuds to rest gently against the ear. More details below. Even after wearing these earbuds for a few hours, you still might not even notice that they are there because of the lightweight design and comfortable fit. Traditional earbuds require a specific fit in the ear and the hard plastic can cause pressure points over time, but the earhook design on this unit eliminates that issue. The rubberized earhook design is soft and flexible and it allows you to keep the earbuds from pushing tightly into the ear. Philips SHS3200 earbuds stay in place very well, even for very active listeners. And it is possible to wear glasses alongside the earhooks. Discover the best sports headphones for active users here. The larger driver and case design doesn’t always work well for children or those with smaller ears, and it can be mildly uncomfortable for those users. Overall though, comfort level is very good and it is easy to adjust the position in order to achieve a good fit. The Philips SHS3200 earbuds are well suited for everyday use and even vigorous activity. The rubberized earhook design is robust and very flexible. The earbud case and driver is attached to the earhook via the unique bass tube, so there is a remote chance that this connection could break from too much twisting. Thin wires exit each earbud and hang down, so they don’t follow the earhook up and behind the ear. You can reroute the wire behind the ear but it will shorten the cable. Those thin wires are also the weakest component of this otherwise robust design. The cables can be pulled out or broken under the right circumstances. A 47-inch (1.2m) symmetrical side-by-side cable features a copper-plated 3.5mm straight connector. 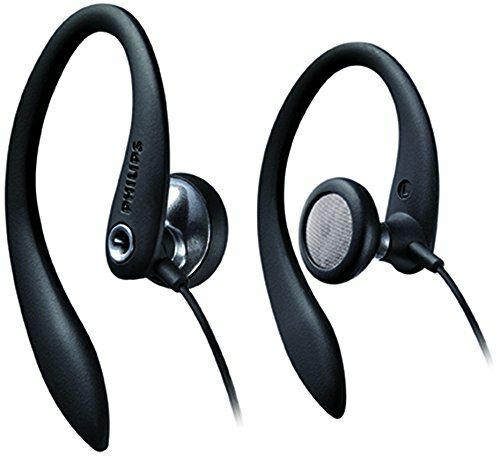 In-line controls are not an option, but you may select from several different color choices in the Philips SHS3200 earhook headphone series. Labeling and branding on the earhook assembly is very subtly stamped into the rubberized finish and is not flashy at all. With 15mm neodymium drivers, these earbuds are some of the largest on this list, and an integrated bass pipe is designed to enhance the lower frequency response. Bass response is good, but bassheads are not going to be impressed. It is important to position the earbuds properly to get the best bass performance possible. And given that these earbuds rest lightly against the ear, you won’t get the typical seal within the ear that you might be used to with other earbuds. Highs are relatively clear and crisp, but the mids can sound a bit muddy and under-represented in the mix at times. The V-shaped sound signature of the Philips SHS3200 earbuds is good for listening to a variety of musical genres even at a lower listening volume. With a soundstage that is slightly more forward than some other earbuds, these provide consistently good focus and presence for an enjoyable listening experience. Overall volume output is good and seems louder than a lot of other stock earbuds shipped with most consumer devices. There is absolutely no ambient noise isolation with these earbuds, so using them in louder environments may require a higher listening volume. Ever heard of noise cancellation? These are the best noise cancelling headphones at the moment. The Philips SHS3200 earhook earphones are definitely worth checking out if you need a lightweight set of earbuds that are comfortable, stay in place, and provide a dependable listening experience. With a popular design that goes back several years, Sony MDR-J10 H.ear headphones provide a secure earhook and earbud design that delivers quality sound. While these aren’t the best for smaller ears, they are perfect for users who need a low profile earphone design that can fit under a hat or helmet. The around-the-ear plastic earhook design allows these earbuds to gently rest just inside the ear opening without creating any significant pressure points. The earbud driver is designed to fit just inside the ear and at a slight angle. This allows for monitoring ambient noise and adds to the overall comfort. With a very flat profile on the ear, users can easily wear these headphones with a hat or helmet and not worry about them falling out or rubbing against the sides. The hard plastic earhooks are not very flexible or moldable, so they tend not to fit that great on people with smaller heads or ears, and they could slip around a bit. The earhook design is also not very compatible with wearing glasses, though you may be able to move the earpieces around to get a semi-comfortable fit. Sony MDR-J10 earbuds with the non-slip earhooks are good for active users and should stay in place well enough for the average listener. The design of these headphones is attractive and functional, but the plastic used tends to be hard, brittle, and not the best when it comes to flexibility and durability. That’s not to say that these are not suitable for sports or everyday use, because they do hold up under most normal conditions. 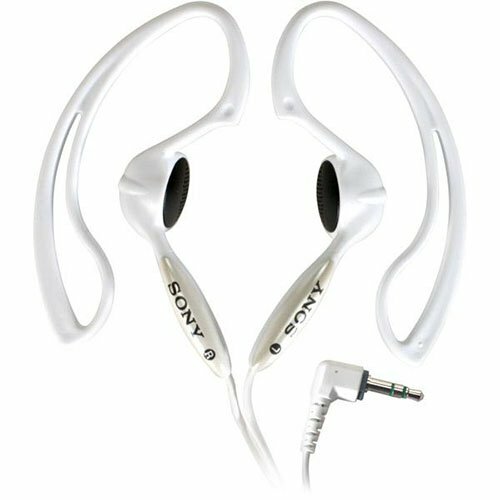 However, users should take care not to crush, excessively twist, or otherwise damage the plastic earhook connection to the Sony MDR-J10 H.ear earbud drivers. The 4-foot (1.3m) side-by-side style cord comes with a cable cinch and an angled 3.5mm connector. A tail piece extends at the end of each earbud to allow the cable exit an easy path out and down from the ear. Note that the cable can bend sharply at this point. The strain relief for the small earbud wires is marginal, as most reports of failure come from intermittent connections and damaged cables. In fact, some users have complained of getting shocked by the earbuds when an internal wire will break loose and built up static against the headphone body. These earbuds are suitable for activities and exercise, but they are not very resistant to moisture, so take care to keep them dry and wipe away any excess sweat or water. Sony MDR-J10 headphones are known to produce a reliably good sound quality that has enough balance among the frequency spectrum to provide a pleasing experience. The bass response from the 13.5mm drivers is strong enough for the many listeners, but your interpretation may vary depending on how the earbud rests in your ear. Some ear shapes can allow the drivers to point farther to the outside opening of the ear instead of into the ear, which will limit the perceived bass response and volume. Highs frequencies are well defined and allow instruments and vocals to cut through the mix as appropriate. Highs can border on the shrill side at higher listening levels. Since these headphones do not seal against the ear, there is sound leakage and you should be aware that using these in quiet public spaces might not be appropriate. The Sony MDR-J10 H.ear headphones with the non-slip design hearhooks are a good balance of audio performance, fit, and style for users that are not typically rough on headphones or don’t require moisture resistance in a workout set of earbuds. Looking for better in-ear headphones but still under $100? Click here. If you want to receive future updates and more news about the best old and newly released headphones subscribe or like our website. Have your own opinion about classic earbuds? Leave a comment below, we want to hear it!